Ipeo is a super clean, fast loading and striking WordPress theme that is perfect for young startups and businesses looking for a no nonsense really easy to use theme but retains an elegance and sharpness associated with fine design. Placing emphasis on sensible defaults makes managing Ipeo a breeze. Our detailed documentation will have you up and running with a full featured WordPress website in minutes. Ipeo is also really easy to customize for those who want to use it as a starting point for their own branding and customizations. We provide 5 color options to help make your customizations even easier. jQuery Homepage Slider – proudly promote unique selling points of your business right on the homepage. Featured Content Widget – easy to use widget that let’s you feature key pages on your website. Homepage Announcements Theme Option – have you got something important to flag to your customers and clients? Our Announcements theme option lets you quickly add a prominent message on your homepage. Fully widgetized Homepage – with 7 widget areas you can completely customize your homepage layout without any coding skills. Showcase your proudest achievements using the Showcase/Portfolio Custom Post type. jQuery optimized Showcase landing page. Display recent Showcase items on your homepage with the Latest Showcase/Portfolio widget. Powerful unbranded Theme Admin Options Panel. Tweak the look and feel of your website without any coding skills using the easy to use Theme Admin Options panel. Switch on/off website logo and taglines. Select different theme color schemes. Switch on/off Homepage Announcements and Social Media links. Fully integrated with WordPress 3.0+ Menus. 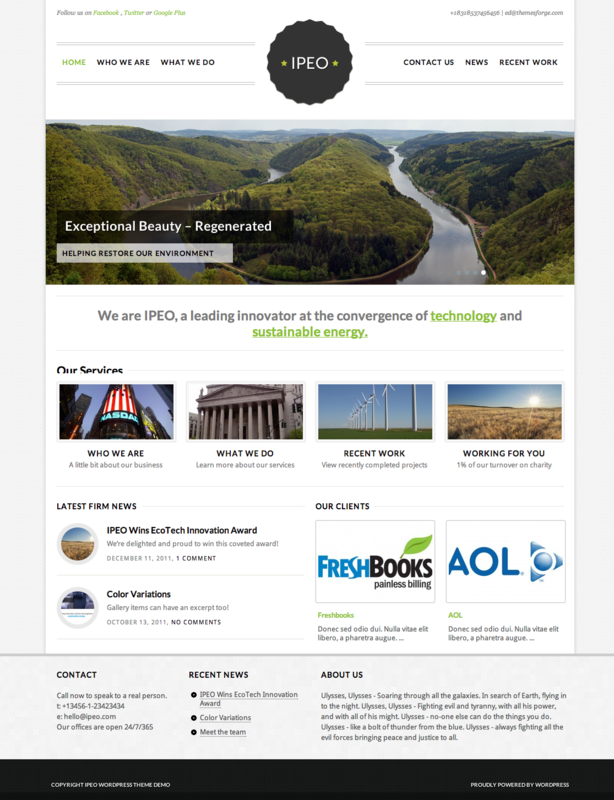 We’ve spent hundreds of hours to make sure Ipeo makes building a great looking website as easy as possible. Just enough theme options for all the important stuff. Completely unbranded for your convenience. with a dynamically sortable Showcase landing page. integration with WordPress featured thumbnails.